Dr. Bob Snyder joined OSC in 1994. 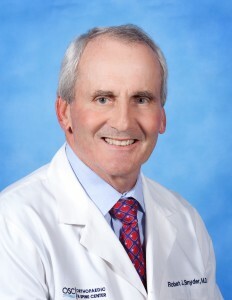 He is a board-certified orthopaedic surgeon in Newport News whose practice is primarily focused on arthroscopy of the knee and shoulder, as well as total joint replacement and treatment for sports-related injuries. Dr. Snyder is a competitive handball player and has also had a partial knee replacement. As an active athlete, he greatly understands a patient’s drive to return to the game quickly and with the best performance level possible. His personal experience with knee replacement and arthroscopic surgery on his shoulder, ankle and knee, help him to better understand patients who are feeling pain and discomfort from their musculoskeletal conditions. Dr. Snyder and his wife Candy have four children, four grandchildren, three Golden Retrievers and five cats. Dr. Snyder has played competitive handball for over 40 years, playing on average three times per week. He often travels great distances for handball tournaments. Dr. Snyder also enjoys running and golf, when he finds the time. To make an appointment with Dr. Bob Snyder or one of our other orthopedic professionals, call our office today or connect with our online Patient Portal. It is 6 weeks today since my total knee replacement and I am absolutely pleased with the results. I will be back on the golf course next week! Dr. Snyder’s approach to pain management was awesome! Dr. Snyder uses the ConforMIS Knee Replacement System.